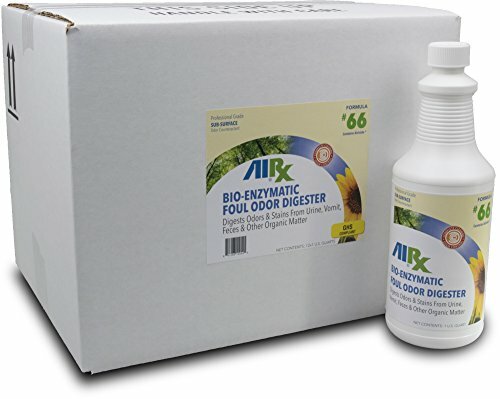 Bullen Airx RX 66 bio-enzymatic foul odor digester is a synergistic blend of specialized stains of live, but safe-to-use bacteria, bacteria chosen for their ability to produce enzymes that will digest organic matter that causes foul odor. There are good bacteria and there are bad bacteria. The bad ones can cause sickness and disease while the good ones are instrumental in such things as fermentation of beer, curing of tobacco and processing of cheese. RX 66 contains only good bacteria, in this case designed to remove foul odors and stubborn stains by bio-enzymatic action. When these good bacteria in RX 66 come in contact with organic matter, they act like sponges to absorb it. Then enzymes produced by the bacteria liquefy and literally digest the matter as their food. In the process, nothing more is produced than harmless carbon dioxide, water and more enzymes. Digests foul odors in and around urinals and toilet fixtures, chemical toilets, refuse containers, etc. in urinal drains and traps; in carpets, upholstery and fabrics; in animal pens, cages and runways. Removes stains from urine, feces, vomit, blood, milk, wine, coffee and other organic matter. If you have any questions about this product by Airx Labs, contact us by completing and submitting the form below. If you are looking for a specif part number, please include it with your message.